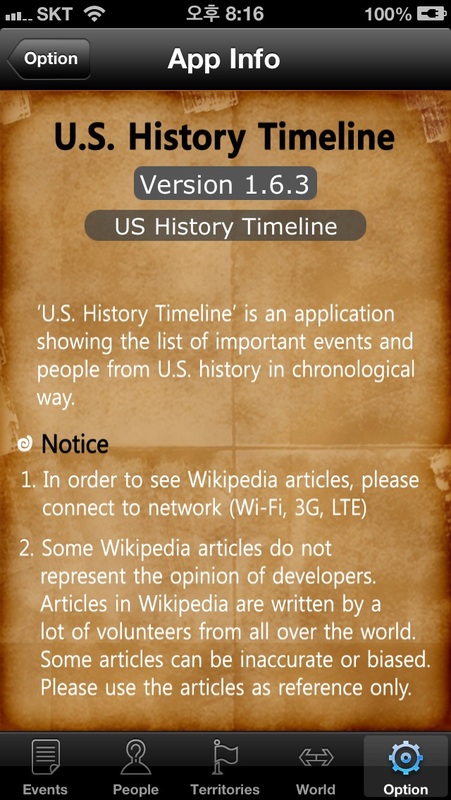 The 'US History Timeline(Free)' is an application which shows the list of important events from US history. Each event includes a hot-link to the appropriate entry of Wikipedia. This will help users get more information about the event. 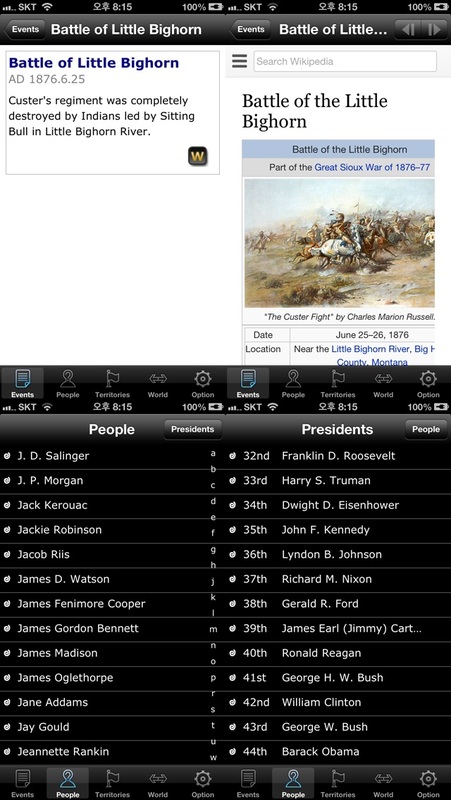 The application also features the maps of important times, list of important people, and comparison table of US history and World history. 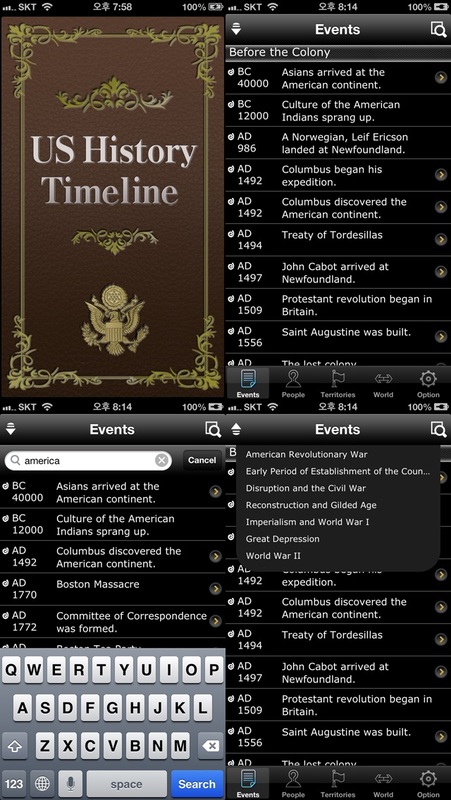 You can enjoy US history easily on the go with US History timeline. Features 1. 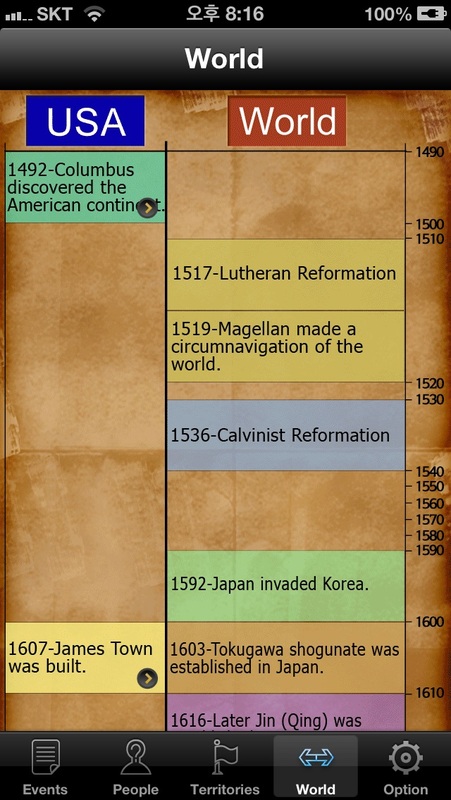 US history timeline 2. Hot-links to the entries of Wikipedia 3. Maps of important times 4. List of people and the Presidents 5. Comparison table of US history and World history * Notice 1. 3G or WiFi access is required in order to access Wikipedia. 2. The explanations in Wikipedia may be different from the developer's opinion. Dev•Sales: DaolSoft, Co., Ltd. There are a lot of grammar mistakes, but also not a lot of context. I was disappointed when the app said American Indian culture "sprang up" and then skipped 13,000 years to the Vikings, never again to mention First Peoples until the French and Indian War. Grammar is terrible.hard to take seriously when simple proof reading would have caught issues. No depth of information on anything. Lots of factual mistakes. There are too many inaccuracies to take this seriously. Some information is not correct. The first black President was John Hanson. He was appointed by congress. There were 5 biracial President before Obama. Like others have already said, the idea behind this app is wonderful. I would love to have a timeline of US history at my fingertips at any given time. I also really like the addition of the maps and the important people. However, my biggest complaint is the lack of depth. Most of the entries have only a couple sentences for a "description." It is extremely simplified and I haven't really learned anything from it I did not already know. The links to Wikipedia are nice, but combined with the poor quality of entries within the app, I feel like the links were included mainly as a substitute for putting some actual effort into detailing the information included in the app itself. If I want to use Wikipedia, I can just go straight to the website. I was hoping to have an app on my phone that would provide at least a decent summary of the historical events directly and ideally without having to go online. Also, I feel I should mention that, along with lacking detail, some of the information included is either incorrect or only partially true. For example, this is the entry for the Boston Massacre: "As British army fired at the crowd and five people were killed, the crowd began to riot." Now, I'm not going to go into the poor grammar and the one-sentence "summary," and I will try not to chew your ear off with a long history lecture. What I will point out is what really happened was a mob was harrassing a British sentry and more soldiers were sent out to help him. They ordered the crowd to disperse, and only when the civilians turned violent and the soldiers began to fear for their lives did they shoot. In short: the riot provoked the firing, not the other way around, as this entry suggests. Two stars because, while the app certainly has much potential, I am pretty disappointed with it the way it is now. I will, however, keep this downloaded on my phone in the hope that the makers will fix/revise the content and add more description. If they do, I would likely give it five stars. As other reviews have stated, the grammar is poor. My next problem (I will avoid discussing the historical inaccuracies) is that this app tries to cover too much history, and doesn't go into any depth to help users understand the meaning or context. The maps, however, are a great start, but could also use some additional context. It gets two stars for having great potential, especially with so many schools using tablet devices in the classroom. 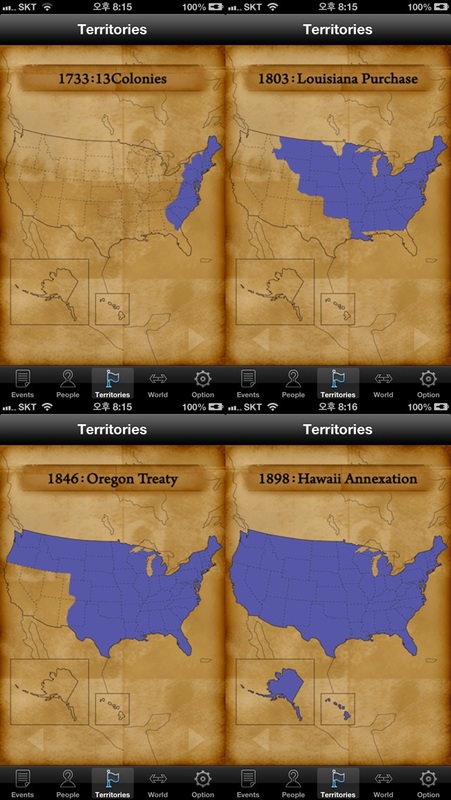 The idea of having all of US history at your fingertips is wonderful. But, this app is in need of serious revision and editing. This program states that Hurricane Katrina flooded 80 percent of Louisiana. That's silly, and makes me worry about the trustworthiness of the whole thing. This app give no discussion of slavery, Jim Crow segregation, or any of the milestone (positive or negative) about the African-American experience or condition in the U.S. THIS APP IS A DISCRACE!